Nigeria’s leading sports betting company has blazed the trail as usual by being the first to introduce the bet builder feature in Nigeria. Surebet247 (Chess Plus Internation Ltd) introduced the bet builder feature with other unique features like the Pulse Bet, Action Bet and Fast market. Unlike a regular accumulator bet, Bet builder allows punters to combine up to six options/markets on an event on one bet slip. Bet Builder allows customers to customize their bet based on what they think would happen in a match rather than going with the pre-listed markets available on the site to everyone. You can add up to 6 selections to your bet from the markets offered on a football or basketball game. You can combine options like; Match Result, Both to Score, Total Goals, Anytime Goalscorers, Corners, Cards and Team Specials. You select any of the markets, add them to your bet and Surebet247 would auto calculate the odds of the markets selected. 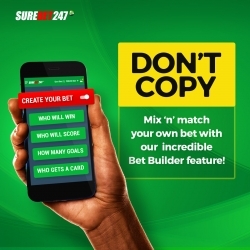 Surebet247 bet builder is available on live and pre-match football bets and pre-match basketball bets at the moment. Enjoy the best of NBA, Euro League/ Euro League Basketball, UEFA Champions League, International Football tournaments and FIBA competitions using the surebet247 Bet builder. The feature is available to mobile users and punters who use the Surebet247 app.